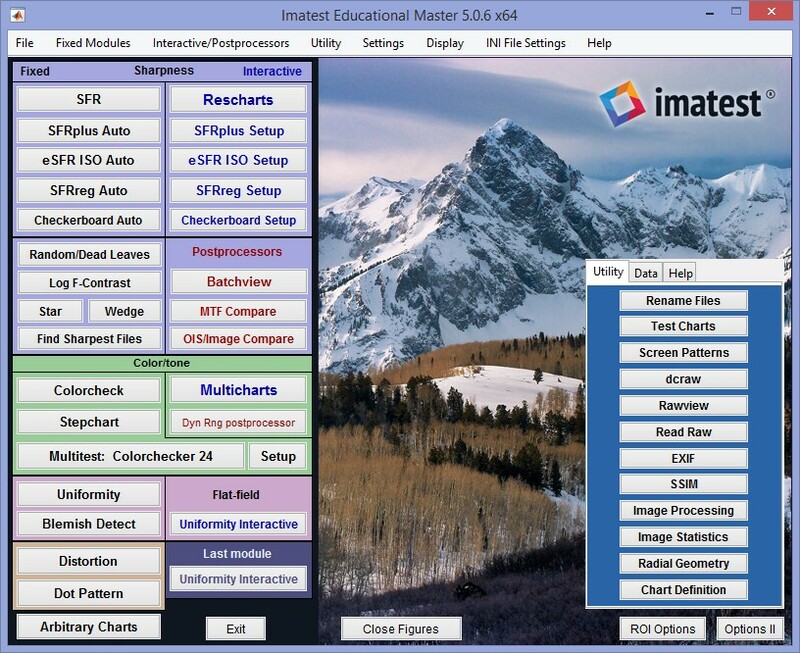 Imatest software can measure a great many digital camera image quality factors from test chart images. If you’re just getting started we recommend that you explore the Image Quality factors page. 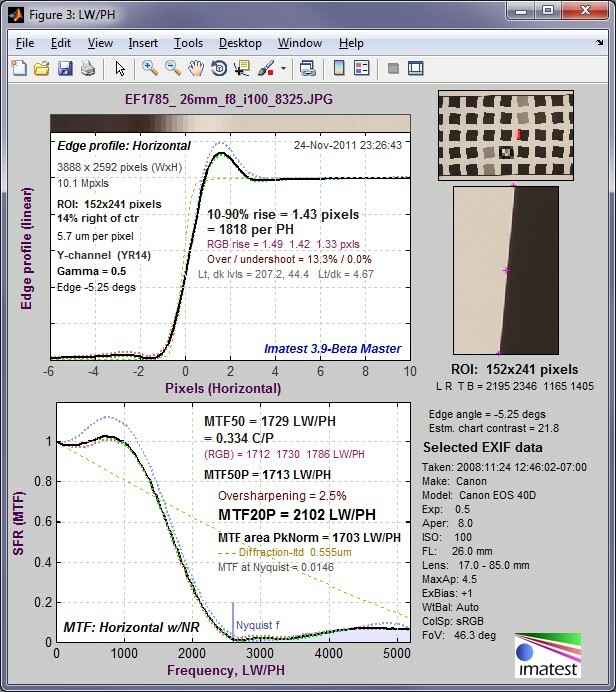 The two most widely used modules, SFRplus and eSFR ISO, can measure a great many image quality factors from single test chart images. Other modules and charts let you work with a wide variety of testing challenges. from Windows Start menu: Start → All Programs → Imatest → Version → Imatest Edition , illustrated on the right. or from the Imatest directory, typically C:\Program Files (x86)\Imatestversion (where version is Master, IS, Studio, etc.) in win64 English language installations. After several seconds (up to a minute after the first installation or a reboot), the Imatest main window, shown below, opens. Imatest analysis modules are run by clicking on one of the buttons on the left. Utility module buttons are on the right. Instructions for the individual modules are on their own pages, listed below. 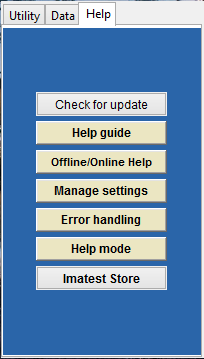 Clicking Help mode (at the bottom of the window) changes the function of most buttons so they open online help. Click here for the documentation Table of contents. Prior to Imatest 5.0 the Utilities (shown above) were displayed on the right side of the window. In 5.0 you can select the Utility, Data, or Help tab to display different sets of buttons. Some of the functions in the Data tab are new to 5.0. The contents of the two additional tabs are shown on the right. Font size: set it so it appears correct in figures, i.e., not too small or large. Normal or enlarged screen (Imatest main window). Normal or enlarged figures (1.25 or 1.5x). You may need to enlarge the font for enlarged figures. The following steps are typical for most Imatest modules. Open the image file. A dialog box requests the name of the input image file. Supported image file formats are listed below. Commercial raw formats converted using dcraw. These include CR2, NEF, RW2, and many more. The dcraw link lists supported cameras rather than the extensions. New cameras are typically added to dcraw within a month or two of their introduction. The build of dcraw included with Imatest releases may be out-of-date. Check the dcraw page for recent builds. Binary files identified by extensions specified in the Generalized Read Raw window. You can set the pixel size,bit depth, demosaicing parameters, offset, etc., for the extension. A large variety of image acquisition devices— too many to list here. For 4-16 input files (8 recommended), you can calculate temporal noise with Multicharts or Multitest. The files should be in the same folder, have the same pixel dimensions (for most modules), and be framed identically (except for SFRplus and other modules that use automatic detection, where they can be any size). If you choose Combine files, you’ll have the option of saving the combined file with 16-bit TIFF format as default. Batch mode is not supported in interactive modules such as Rescharts or Multicharts. For combined files, the saved file name is the same as the first selected file name with _comb_n appended, where n is the number of combined files. Enter additional input data. Unless Express mode has been selected, a Settings window opens that settings data, depending on the module. Most additional data is optional (and is saved from previous runs); you only need to pay attention to settings you wish to change. Click OK to run the program or Cancel to terminate the run. Save results? A dialog box asks if you would like to save the results. Checkboxes in the dialog box enable you to select the Figures, CSV (Excel-readable), and JSON files to be saved. You may examine the results before deciding which, if any, to save. (The Save box is omitted in the evaluation version.) Figures can be saved as PNG (losslessly-compressed) image files or Matlab Fig files (not recommended because of their large size), which can be opened and manipulated with Open Fig file. Each of these buttons opens a large Help window with lots of explanations and buttons that open a variety of functions. You should familiarize yourself with them and use them whenever the need arises. Help guide opens a window with links to some of the most useful instruction web pages as well as brief explanations of what they contain, including Registration quickstart | Imatest instructions | Image quality factors | Imatest tour | Table of Contents (site map) | FAQ | Change Log | Testing lenses | MTF Curves & Appearance | SFRplus | Troubleshooting. 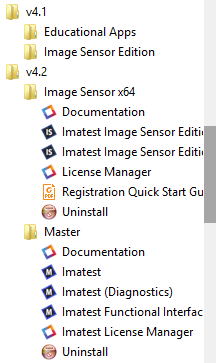 Manage settings opens a window that explains some of the key functions for setting and examining the contents of imatest.ini, where settings are stored. It also displays the full path name to imatest.ini and shows how to fix bugs that can arise when imatest.ini is corrupted. Function buttons include Save settings…, Load settings…, View/Edit settings (ini file), Copy settings (ini file), Import / Merge settings, Edit / Reset Modules, and Reset Defaults (all). Error reporting opens a window that shows what to do if you encounter an error. It includes link to the Change Log and Troubleshooting pages, buttons for Copying the current or last session to the clipboard for pasting into emails, and instructions on fixing imatest.ini when it gets corrupted. RAW files are the unprocessed output of digital image sensors. For Bayer sensors, each RAW pixel represents a single color in RGRGRG, GBGBGB, … sequence. To be converted into usable, standard file formats (TIFF, JPEG, etc. 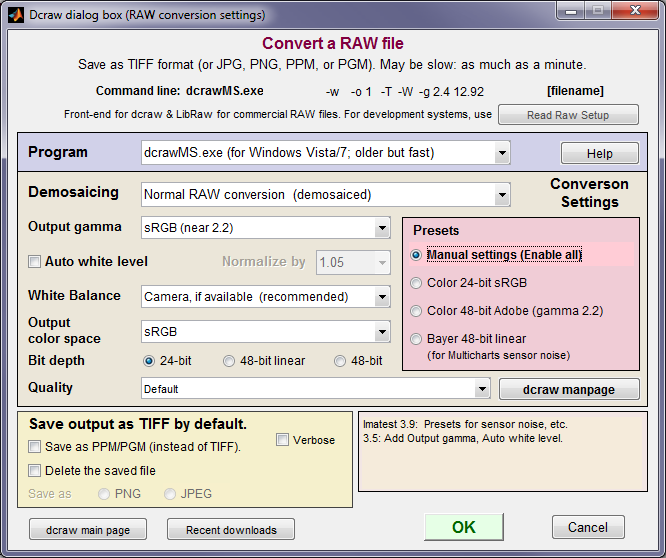 ), raw files must be processed by a RAW converter. RAW converters perform several functions: demosaicing (converting the Bayer sequence into full color), applying a gamma curve, often with an additional tonal response curve, color correction and white balance, reducing noise, and sharpening the image. These operations can affect Imatest‘s measurements, especially SFR. The best way to be sure an image file faithfully resembles the RAW file— that it has a pure gamma curve, no sharpening, and no noise reduction— is to read a RAW file into Imatest and convert it into a standard format (typically TIFF) using Dave Coffin’s dcraw. If you select any of the standard commercial RAW formats (CRW, NEF, etc.) or if a file that contains RAW data (e.g., Phase One TIF) is detected the dialog box on the right appears. It allows you to choose among several RAW conversion options. More detail can be found in RAW files. Imatest can also read RAW files from manufacturer’s development systems using Generalized Read Raw, which enables you to specify file extensions and parameters for decoding them. Exit closes all figures and terminates Imatest. Close figures closes all figures. Important because the computer will slow down if too many are open. You can close figures individually by the usual Windows methods — clicking the X in the upper right or right-clicking on the figure icon on the Taskbar and selecting Close. EXIF displays EXIF data for an image file. Most file formats supported when ExifTool is installed (instructions below). Exif data can be saved in a text file in the same folder as the image for viewing/searching with the Save Exif data button. Open Fig file opens a Matlab Fig file saved during an Imatest module run. Unlike image files, Fig files can be manipulated— most importantly, 3D Fig files can be rotated for enhanced visualization. But Fig files are not generally recommended: they should be used sparingly because they can be as large as several megabytes. 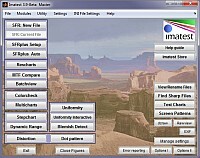 Saved settings: Imatest saves a number of settings, including Font size, folders for opening and saving images, calculation parameters, plot selection, and figures to display and save. To view or edit the settings, click the Settings menu (in the toolbar on the top of the Imatest window), then click View settings (ini file) or Edit/Reset modules. To restore these settings to their original defaults, click (in the toolbar on the top of the Imatest window), then click Reset defaults (all) in the Settings menu. The settings are stored in imatest.ini. Lots of details about saved settings— including how to fix errors that may result from corrupted ini files— can be found by clicking Manage settings on the lower-right of the Imatest main window. ROI Options and Options II… (bottom-right of the Imatest main window); also in the Settings dropdown menu) opens the boxes shown below, which allow several options to be specified. Use new ROI selection method Opens a different window for selecting regions. It allows more flexibility in selecting multiple regions (SFR and Wedge). ROI (Region of Interest) section controls cropping options. SFR ROI filtering When Light filtering is checked the tests that validate the SFR ROI (region of interest) are relaxed. This can be useful when testing noisy images, rough edges, images of endoscopes or other devices with interfering patterns, but it can lead to errors if regions are selected carelessly. Normal filtering is the default. 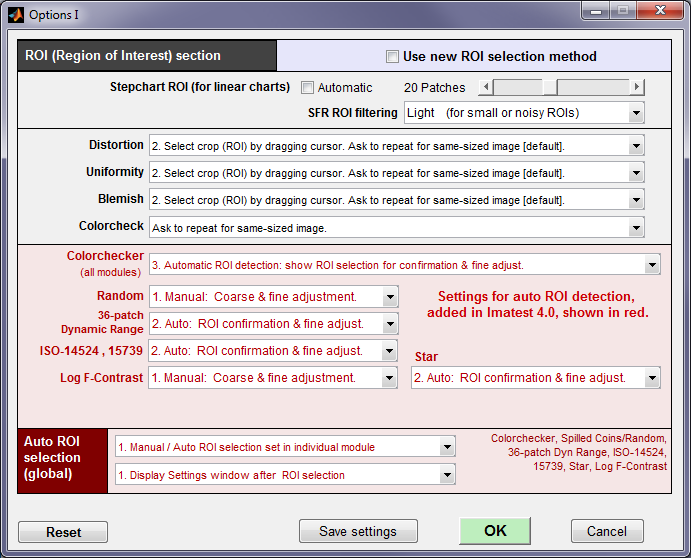 Stepchart ROI selection Automatic patch detection (following manual region selection) can be toggled. If it is turned off, a fixed number of patches (6-41) can be selected for Stepchart analysis. This option is useful when high noise in dark regions confuses the automatic ROI detection. Colorcheck, Distortion, Light Falloff Cropping options. You can select whether to ask for cropping and whether to use the last crop (for same-sized images). For Colorcheck you can also choose between traditional automatic patch detection and Multicharts-like patch detection, where all squares are shown in the fine adjustment window. Reset restores defaults: it sets SFR ROI filtering to Normal, Stepchart ROI selection to Automatic, turns off all global folder settings, and checks Get EXIF data . Options II for setting folder options, SFR save file suffix, etc. Global folders The default folders for opening files and saving results can be set globally using the second group of controls. Normally (with Global folder for opening files unchecked), the default folder for opening files is changed only for the Imatest module in use: one module at a time. When it is checked, the default folder for opening files is changed for all modules. This can be convenient if project data for several modules is stored in the same file. When either of the Global folder for saving results… radio buttons is set, the default save folder is changed for all modules whenever the input folders are changed. 3 Get EXIF data from ExifTool & save ALL EXIF data in csv output (LOTS)! Detailed! Recommended settings 2 and 3 (ExifTool) work with virtually any file type and capture virtually all available EXIF data. If the setting 3 (save ALL EXIF) is selected, all the EXIF data— a large amount; some quite obscure— is written to the CSV output files. Setting 4 (Matlab’s built-in function) returns limited results. Setting 1 is for rare cases that cause EXIF read to crash. Go to the ExifTool home page and download the Windows standalone executable (a zip file). EXIF color space settings can be confusing because two tags affect color space, and their relationship is not logical. LARGE FILES (Light Falloff, Distortion) These two modules typically use little or no cropping. As a result, memory may sometimes overflow. This setting offers the option of cutting the image dimensions in half (1/4x in area and memory) to avoid memory problems. Special user code enables custom features for specific users. Normally blank. Batch run order The actual order of batch runs may differ from the order of selection in curious ways that depend on the operating system or other factors. With one of the choices in this popup menu the run and selection orders should be the same. Help opens a relevant web page on computers connected to the Internet. Dropdown menus are located at the top of the Imatest main window. Most items duplicate the controls elsewhere in the window, but some are unique. File contains System command, View or Copy the Current or Previous Session for reporting errors, Clear Memory, Close Figures, and Exit. System command lets you execute a DOS call on Windows computers through Imatest. The session commands are useful for debugging, as described in Troubleshooting and in the Error handling window. Clear Memory removes the image data stored after running SFR. This may release enough memory to speed up memory-intensive modules, such as Uniformity. Modules opens Imatest analysis modules. The entries duplicate the buttons on the left of the Imatest main window. Utility opens Imatest utility modules. The entries duplicate many of the buttons on the right of the Imatest main window. Settings contains functions that control various aspects of Imatest operation. Many can be accessed from the Manage settings window. 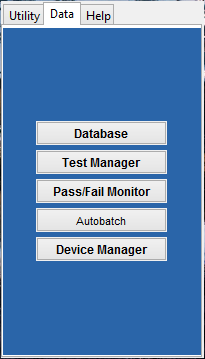 IT options sets several options for controlling IT (Industrial Testing) runs. 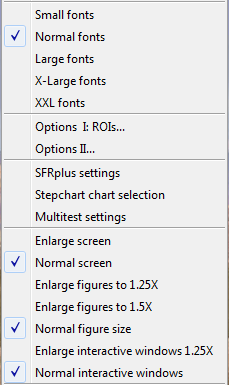 Small / Normal / Large fonts alters the font size in output figures and GUI windows. The default is Normal. The setting is saved between runs. This address problems with tiny fonts in high resolution screens (1600x1200 pixels and above) or larger than expected fonts which appear when the video card DPI setting is Large size (120 DPI) instead of Normal. The video card setting can be accessed by right-clicking on the Windows background, then clicking Properties, Settings, Advanced, General (tab). Large fonts are displayed if DPI is set to Large size (120 DPI). 96 DPI is normal. Windows may need to be rebooted before new settings take effect. Options I and II contain settings that affect SFR ROI (region of interest) error checking, Stepchart ROI selection, and folder names for storing results, and more. DOS command allows you to enter a DOS command while Imatest is running. Useful for troubleshooting, for example, for diagnosing path issues. When checked, Fixed sharpening radius keeps the SFR standardized sharpening radius fixed, even for edges with poor MTF where it would otherwise automatically increase. Enlarge hi res figs applies only to high resolution screens (1600x1200 pixels and above). When this box is checked (by default), images are enlarged so they don’t look tiny on the screen. Unchecking the box turns this feature off. Images are smaller but better suited for website presentation. The setting is saved. INI File Settings contains operations that affect stored Imatest settings (the contents of imatest.ini and other INI files). Many can be accessed from the Manage settings window. Manage Settings opens the Manage settings window. Save Settings copies settings from imatest.ini (which stored the current, active settings) to a named file (with extension ini). Particularly useful for saving regions of interest (ROIs) for SFR runs and for controlling Imatest IT modules. The most recent folder used to save or retrieve settings is displayed in the file selection dialog box, but any folder may be selected. Load Settings retrieves settings from a named file (with extension ini) and stores them in imatest.ini. It is useful for restoring ROIs or for restoring settings after they have been reset. The most recent folder used to save or retrieve settings is displayed in the file selection dialog box, but any folder may be selected. View/Edit Settings displays the settings— the contents of imatest.ini— in the Notepad viewer. You can edit this file (with care!) and save it as a named file if desired. You can send us the contents of imatest.ini for help with troubleshooting. The Notepad window should be closed when you are finished viewing it: it may interfere with some Imatest operations. INI File Editor (formerly Edit/reset module(s)) opens a special editor that allows ini file values to be examined and entire sections to be deleted if the corresponding module crashes. Described in Troubleshooting. Scan & repair INI file Scans the INI file for errors that may be introduced when there are non-Latin characters (Chinese, Hebrew, etc.) in path names. Reset Defaults (All) restores settings to their default values by resetting imatest.ini. This sometimes clears bugs. See Troubleshooting. Use only as a last resort. It is a good idea to save settings prior to resetting them. Help contains Online Help, Register, Register Upgrade, and About, and Welcome window. Most are included with brief explanations in the Help guide window. Online Help corresponds to the Help button; it opens a browser window. Register and Register Upgrade are used to register Imatest. About displays the Imatest version and user registration information. Check for updates opens a web page that shows the latest version. Welcome window displays the window that normally appears when Imatest is started in evaluation model. Several additional web pages, including this one, are included. Imatest figure: You can resize it or zoom in on individual plots. The toolbar, which includes Data cursor , is shown. Imatest results are displayed in individual windows called Figures. A typical figure— a result of running SFR for a Canon EOS-40D— is shown on the right. Figures may be resized, minimized, maximized, or closed using standard Windows operations. In addition, several Windows and Matlab-specific operations can be found in the toolbar at the top of the image. The first four icons in the toolbar are standard Windows icons: New file, Open, Save, and Print. Open and Save refer to Matlab .fig figures. Imatest allows you to save figures as PNG files— an excellent format with lossless compression— or as Matlab fig files, which can be manipulated, but which require much more storage (not recommended). Of the remaining icons, Zoom in: is particularly useful. Clicking on it highlights it and enables you to zoom in on regions of the plots. You can click and drag to create a zoom rectangle or you can click on any point to zoom in on that point. Double-clicking anywhere inside the image restores the full unzoomed image. Imatest 3.6+ includes an extremely useful function called Data Cursor, selected on by the toolbar icon. When selected, you can click on a curve and display its coordinates in a small box called a Datatip. Right-clicking on the Datatip lets you can delete it or choose additional options. In most modules, figures can be saved as either PNG files (a standard losslessly-compressed image file format) or as Matlab FIG files, which can be opened by the Open Fig file button in the Imatest main window. Fig files can be manipulated (zoomed and rotated), but they tend to require more storage than PNG files, especially for 3D files, which can be generated by SFRplus and Light Falloff. In general, PNG files are preferred unless significant manipulation will be required at a later time— for example if you wish to rotate 3D files (which can be several megabytes). Figures can proliferate if you do a number of runs, especially SFR runs with multiple regions,and system performance suffers if too many Figures are open. You will need to manage them. Figures can be closed individually by clicking X on the upper right of the Figure or by any of the usual Windows techniques. You can close them all by clicking Close figures in the Imatest main window. To see Figure resource use, open the Windows Task Manager. In Windows XP, click Control-Alt-Del or right-click in the Taskbar, usually at the bottom of the screen. Click on the Processes tab, then click CPU twice so the tasks with the most CPU usage appear at the top. Imatest can be a real CPU hog when several Figures are open; CPU use appears to increase with the square of the open Figures. With Imatest 3.5.1 or earlier on my dual 1 GHz Pentium Windows XP machine, 8 open Figures use 6% of the CPU; 16 open Figures use 33%. Over 20 would seriously slow the computations. Individual Imatest modules can optionally write two types of output file that contain most results. CSV files are most often displayed with Microsoft Excel. JSON files, which contain a single large JSON structure, can be read into programs written in almost any language with a single line of code using functions linked from the JSON website. They can be displayed in any text editor. CSV files– Excel-readable Comma-Separated Variable format. Here is an example of typical output. The same data displayed in Excel looks like this. JSON files are somewhat human-readable text files that contain a single structure— optimized for reading into programs written in virtually any programming language. The full text of the Imatest license can be found here. License holders are encouraged to publish test results in printed publications, websites, and discussion forums, provided they include links to www.imatest.com. The use of the Imatest Logo is encouraged. However you may not use Imatest for advertising or product promotion without explicit permission from Imatest LLC. Contact us if you have questions. Sturdy camera support Use a sturdy tripod, cable release, and, if possible, mirror-lock. Target mounting If you are working outdoors, be sure the target doesn’t shake in the wind. Target distance Be sure you’re far enough from the target so the printed edge quality doesn’t affect the measurements. Target distance considerations are given here. Focus Be sure the camera is focused accurately on the target. Note whether you used manual or automatic focus. Target alignment Make sure the corners, as well as the center, are in focus. Illumination Should be as even as possible. Exposure Take care not to clip shadows or highlights. This will reduce accuracy of the results. Raw conversion and settings The choice of RAW converter (in or out of the camera) and settings, particularly Sharpening, can make a huge difference. Contrast and White balance are also important. Settings that affect contrast and transfer curve can also have a strong effect. If possible a “Linear” setting (meaning a straight gamma curve with no additional tonal response adjustments) should be used. Gamma SFR sharpness results are moderately sensitive to the Gamma setting: A 10% gamma error changes MTF50 by 2.5%. Gamma can be measured from slanted edges of known contrast (if ≤ 10) or from a grayscale chart by running Multicharts, Multitest, Colorcheck or Stepchart. Cleanliness and filters Lens surfaces should be clean. You should note whether you have a protective (UV or Skylight) filter. It can make a difference— more likely reduced contrast than reduced sharpness. With Imatest you can find out. File formats Use RAW, PNG, TIFF, or the highest JPEG quality. Never use less than the maximum resolution or JPEG quality unless you are specifically testing the effects of these settings. Lens settings Lens performance is a strong function of the aperture (f-stop) and focal length (for zooms). Be sure to record these settings (easy because they’re saved with the EXIF data) and include them in your reports. The optimum (sharpest) aperture is of particular interest. Lens performance is also somewhat affected by the distance to the target. Rename Files can add key settings to the image file name using EXIF data. White balance Should be close as possible to neutral, particularly in Colorcheck. This may seem like a lot of fuss, but the technique you develop in testing cameras and lenses will spill over to your daily photography. Alfred Stieglitz tested film and developers extensively when he discovered photography as a student in Berlin. Ansel Adams performed extensive tests in the development of his zone system. Although nobody would claim that testing is responsible for their unique vision, it certainly contributed to the skill that transformed their vision into prints of transcendent beauty.